Embarcadero has a section in the Firemonkey documentation about how to build components. 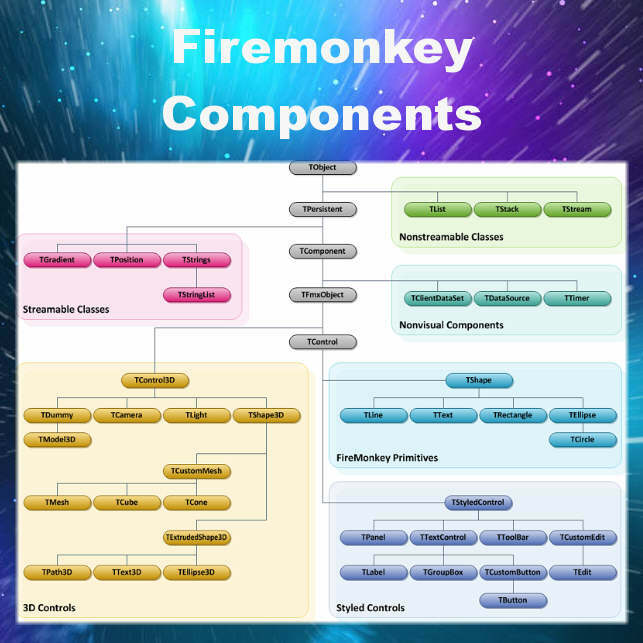 There are three initial sections which over designing, rendering, and a simple object hierarchy of the Firemonkey framework. There is a tutorial for creating new components by extending existing components and a section about building your own component and property editors. A six step tutorial for creating your own TRegularPolygon component is also provided. It goes into detail on how to derive a component from TShape and create the TRegularPolygon component which allows you to set the number of sides that get drawn in the component. Finally it links to two sections which are tutorials for setting size/alignment and defining custom properties on components in both Object Pascal and C++. If you’re interested in building Firemonkey components either for your own use or for sale and distribution this is a good place to start. You should also be able to use this guide to build components for Appmethod. Components built with Firemonkey should run on Android, IOS, Windows, and OSX. Head over and check out the Firemonkey component guide from Embarcadero for Delphi XE7 Firemonkey.